William Booth (Service No 341) was born in Forbes, NSW about 1890 and came with his family to Corrimal, NSW where he attended school. He was a single 22 year old miner, who had served in the St George Rifles Militia, when he enlisted. His brothers Alfred John (Service No 687) and James Edward (Service No 688) had enlisted in August 1914. William embarked on HMAT A53 Berrima on 25th June 1915 with A Company, 20th Battalion, and would have been aware of the death of his brother James at Gallipoli. 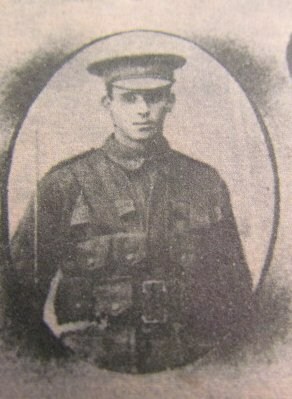 On 14th July 1915 he was promoted to Lance Corporal and was sent to Gallipoli. On 16th November William was at Russells Top in the trenches when he was shot in the neck through a porthole in the paraphet. He was taken to the dressing station but died before he could be treated. He is buried in Shrapnel Valley Cemetery Plot II, Row D, Grave 38. Alfred was the only brother to return to Australia.